It has been a few years since the launch of the unconventional publishing platform, Square Enix Collective. Though it initially seemed like an excuse to see whether or not someone was crazy enough to make a pitch about resurrecting Gex, it has actually opened the gates for many smaller indie studios to potentially realize their own unique games with the helping hand of Square. 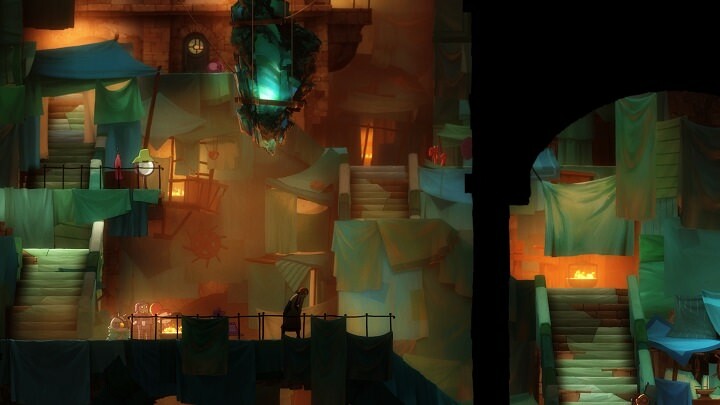 The most recent fruition of their efforts is Throughline Games' gorgeous cinematic adventure game, Forgotton Anne [Editor's note: No, that's not a mispelling; it's really spelled that way]. Does this new indie title paint a brilliant landscape for the initiative, or does it distill only emptiness in its unrealized potential? The pretense of Forgotton Anne initially feels like that of some old children's fable. Inanimate objects forgotten in the modern human world, anything from a bookcase to someone's lost left sock, are whisked away to another world and gain both life and a conscious of their own. Yet, the children's story friendly tone quickly dissipates when those same inanimate objects (called Forgotlings) are immediately assigned labor jobs based on their perceived capabilities. Those that do not comply are quickly regarded as rebels that can have their life force forcefully removed and used as the energy source called Anima. To maintain the questionably strict forgotling status quo created by the mysterious human 'Bonku,' the player takes the mantle of his main 'Enforcer,' or rather the lead heroine 'Anne,' who is often dispatched to take care of such rebels with her life-stealing arca bracelet. From its intriguing setup to its much more enchanting anime-inspired art direction, Forgotten Anne does well to quickly draw the players in. Almost just as fast, Forgotton Anne plays with the moral implications of its lead heroine and her ability to 'distill' these now sentient forgotlings into becoming lifeless objects once more. While the choices themselves are often rather binary, like Mass Effect's paragon or renegade choices, the difference between showing empathy towards a forgotling or maintaining her reputation as a strict enforcer gets far more creative with its direct story usage from its halfway point and on through frequent callbacks to your former actions. However, for as much of a focal point is placed upon its cinematic choice-based narrative perhaps an equal amount if not more of its time is used to its puzzle-platformer adventure elements. The most common puzzle mechanic involves transferring anima (energy) from one object to another, usually machinery, and working around the limitations of it to help get to one's next destination. It's a shame that this puzzle mechanic never really hits either a cerebral or an intrinsic gameplay satisfaction. 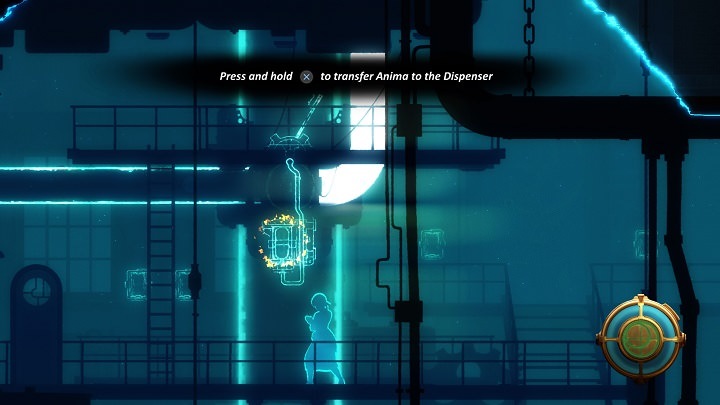 Players should be able to guess what the puzzle situation wants from the player right away and it will just be a matter of having Anne slowing move levers or change the course of electrical panels before reaching the next story beat. The only real exceptions to this anima mechanic usage are more due to their story implications in its latter half than really changing the actual gameplay design itself. Even though the underutilized anima mechanic or its weirdly stiff platforming elements are disappointing from a gameplay standpoint, Forgotton Anne's main appeal lies in seeing how the story will eventually pan it. Despite its vivid art direction and intriguing setup, the early story goings are unfortunately somewhat rather slow because of its larger emphasis on the puzzle adventure elements, which, as stated before, are not as good as they could be. 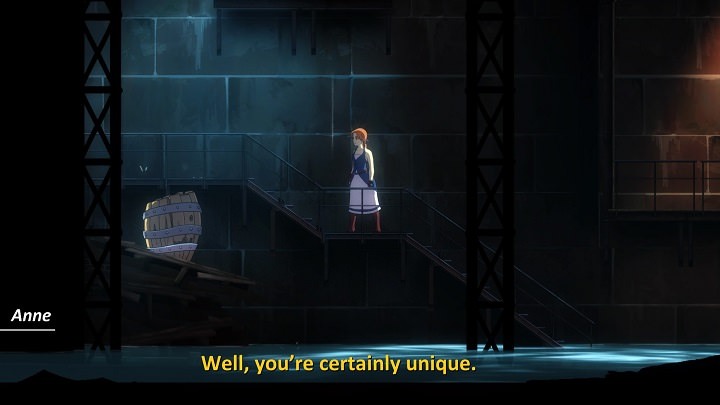 Yet, there is a very clear narrative turning point when a certain forgotling character named "Fig" comes into play who really helps contextualize not only the world itself but even Anne as an actual character. It becomes difficult to empathize with Anne's father figure Bonku because of how much more charismatic Fig is in comparison despite the narrative's attempts at making Anne choose between them. Of course, the most charismatic aspect of all lies within its aesthetic. The environmental backdrops, in particular, are a real treat and it says a lot for its stellar art direction when I can be fresh off of Dragon's Crown Pro, one of the easiest examples of excellent 2D styled animation in gaming, and still be impressed by the visuals of Forgotton Anne. It is genuinely exciting to progress the story, even when it is not hitting on all cylinders with its pacing/shortcomings, because of its imaginatively realized world and eclectic forgotling characters that ooze personality with every animation. The soundtrack itself also has an impressive breadth to its score with some fine orchestral pieces that nicely accompany the visuals as well. However, if there is one strong blight upon Forgotton Anne's presentation, it is the English voice acting itself. While the script is generally fine, despite some really on-the-nose attempts at philosophical contemplation in latter story instances that act deeper than they actually are, a strong majority of the characters have a really stilted voice delivery which can be quite distracting at times. It's not anywhere near Chaos Wars bad or anything, certainly, but for a game with such heavy voice acting usage it takes away the excitement of seeing an interesting new character only to be underwhelmed by them as soon as they start talking, especially when nearly every other facet of the presentation is so alluring. Forgotton Anne is a solid, creative title that is teeming with good intentions. From its memorizing visuals to an intriguing world setup, it goes a long way to pique the player's curiosity throughout its brief story even though it is occasionally obfuscated by its own shortcomings such as so-so gameplay pacing and amateur voice acting performances. 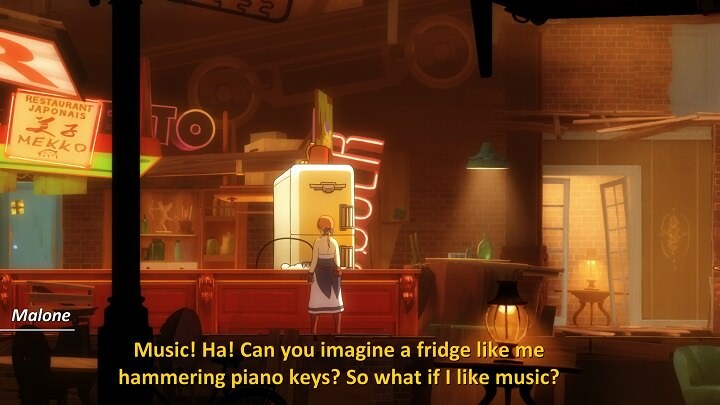 Yet, it is hard to hold that much of a grudge against Forgotton Anne's occasional mishaps in character for too long when its heart is clearly in the right place during its imaginatively realized adventure that somehow successfully breaths so much life into what should be listless inanimate objects.